Whatever your product, Jet can label it. 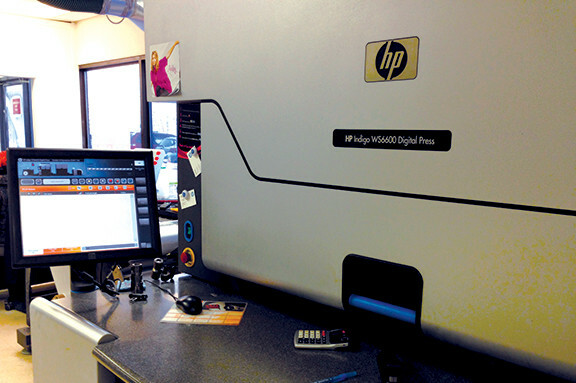 Using both digital and flexo print technology, we offer a complete selection of stocked and customizable labels, stickers, printed tape, tickets, barcode labels, scale labels, tags and thermal transfer ribbon and labels. We serve all major industries such as agriculture, airline, beverage, chemical, forestry, food processing, general warehouse, grocery, nutricuticals, pharmacy and snow sports. 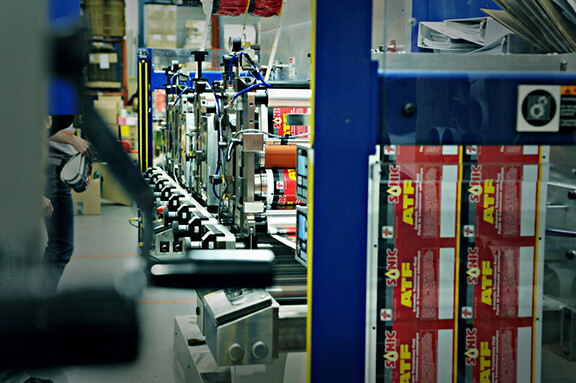 Jet Label has been servicing Western Canada since 1998 with integrity, expertise, and all-in-one solutions for your business labeling needs. Co-owners Darrell Friesen and Rod Froment have grown the business from the smallest label manufacturer with two employees to the largest with over 70 employees. 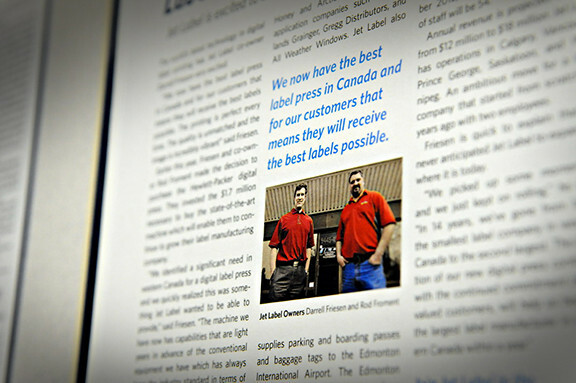 With the best label presses in Canada, Jet customers receive the best labels possible. The printing is perfect every time. 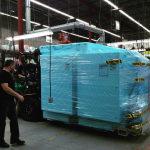 The quality is unmatched and the image is incredibly vibrant.By identifying a significant need in western Canada for a digital label press, Jet quickly realized this was something they wanted to provide. 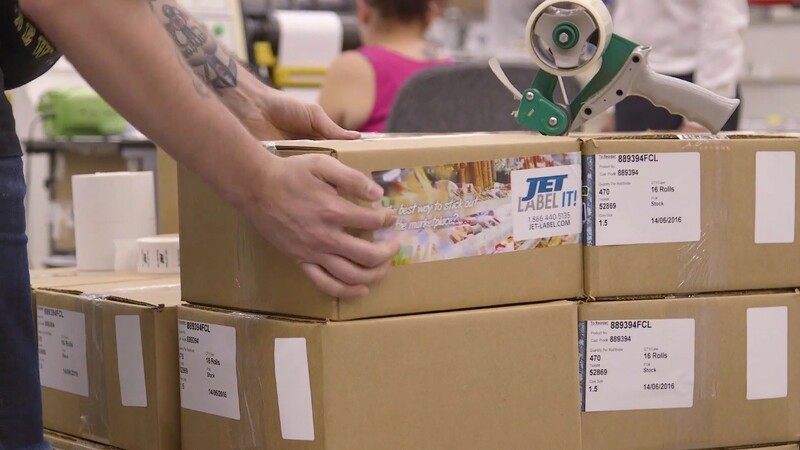 With capabilities that are light years in advance of conventional equipment, Jet Label has raised the standard in terms of quality and efficiency. 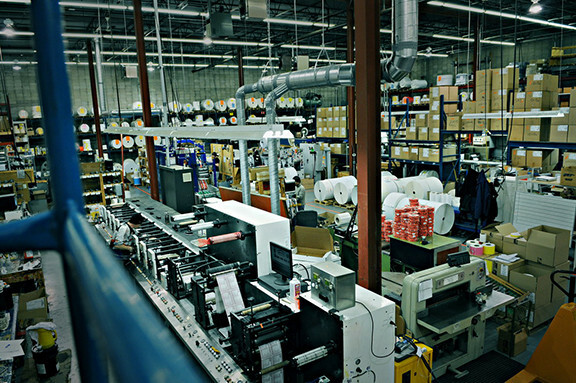 Jet Label manufactures labels and printed tape from its 55,000-square foot manufacturing facilities located in southeast Edmonton. 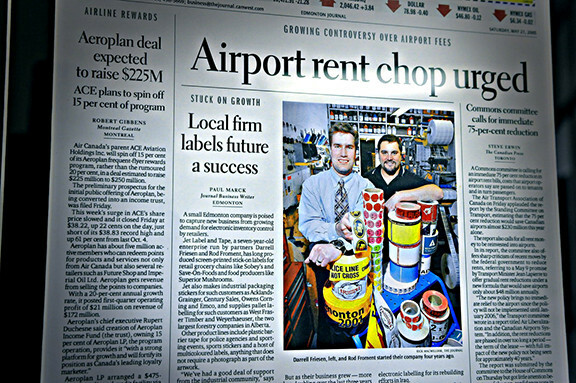 Their diverse client list includes: grocery stores such as Safeway and Sobeys, international forest product companies such as Canfor and West Fraser, consumer product companies such as bee Maid Honey and Arctic Chiller, industrial application companies such as Acklands Grainger, Gregg Distributors, and All Weather Windows. 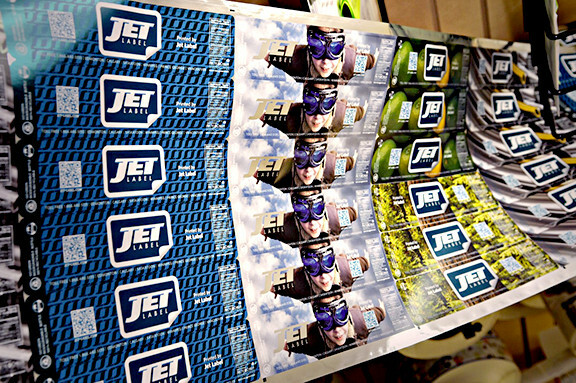 Jet Label also supplies parking and boarding passes and baggage tags to the Toronto, Calgary, and Edmonton International Airports. The Edmonton Police Service has also been a long standing customer. Jet label provides their clients with the most superior product in the most efficient and cost effective manner available. 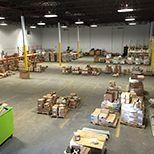 In addition to Edmonton, Jet has operations in Calgary, Vancouver, Prince George, Kelowna, Saskatoon and Winnipeg. 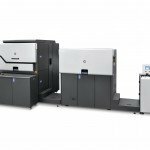 Jet Label boasts redundancy throughout their operations, with two HP WS6600 Indigo presses, two digital converters, two 8-colour flexographic presses, two 6-colour flexographic presses, and two medium web flexo presses. 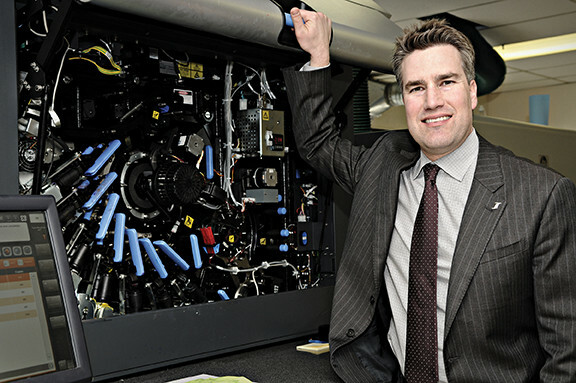 Jet also has multiple “twin” rewinders and air compressors, which ensures that machine downtime never effects their customers. We build, repair and maintain positive relationships. We push our abilities to the limit. We will figure it out let’s do it! We bleed orange & blue. 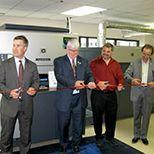 Purchased/installed new HP Indigo WS6600 Digital Press – the first of its kind in Canada. 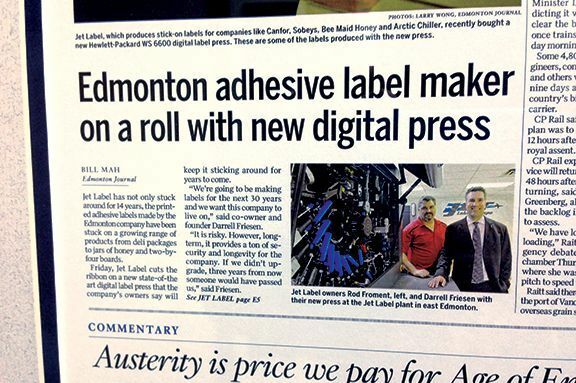 Added the 2nd WS6600 digital press to Jet Label’s production line… before anyone else in Canada even bought their first. 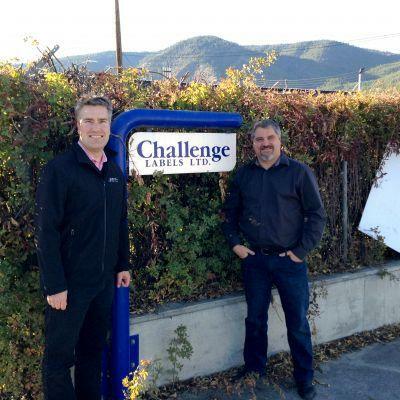 Challenge Label assets arrive at the Edmonton production facility and start to be commissioned. The new $1M Delta finisher arrives!